is shown in real time ! we welcomed 136 New members! Your participation is for FREE without registrations, fees and hidden charges! 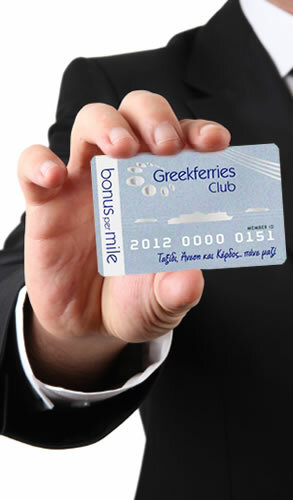 Become a member of the Greekferries Club! Travel to Greece and the Greek Islands with us! Travel to Italy, Spain, Morocco and in the entire Mediterranean, with any ferry company you wish, on the routes that you choose! Gather “miles” by traveling and get Bonuses with every mile you travel! Your Miles are converted into benefits-money-discounts-FREE tickets! Start by filling out the registration form for a new member! With your registration, you are given a gift of 1.000 miles – 1.000 points! The next time you travel, use your card and add the Miles into your account! If you have a discount card with a ferry company, you win with both by making your booking with us! You can check your Miles, your points from your personal administration page and redeem them whenever you want! Travel with us and earn double! Start your registration from here!